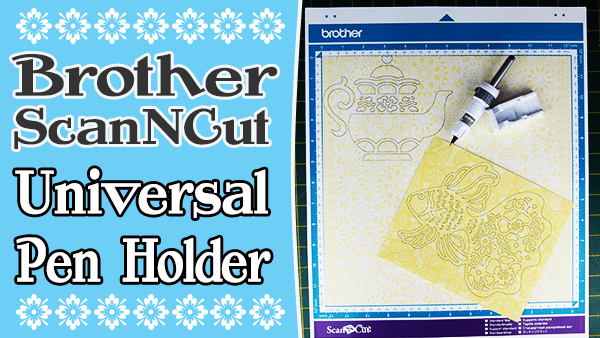 We thought it was about time we did a review and demo of the Brother Scan n Cut Universal Pen Holder. We haven’t had it for very long but I have to say, I wish we had purchased it sooner. 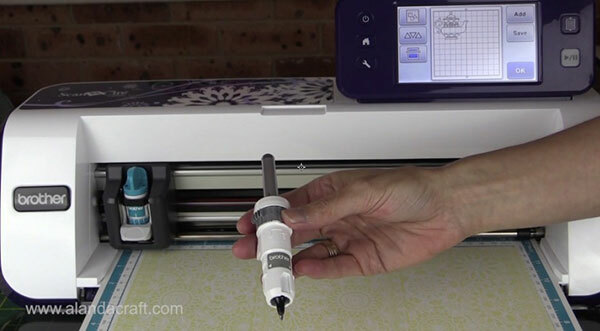 The pen holder allows you to use your own pens when you want to use the drawing function on the ScanNCut. As you can see in the photo we have tried a number of pens and all of these were used with great success. If you’d rather watch a video of this review and tutorial, then scroll to the very bottom of this post. 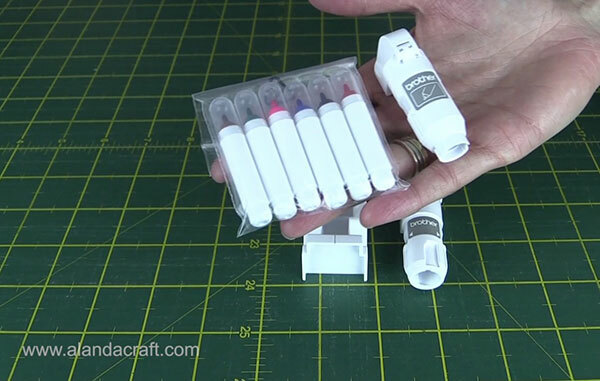 Like us, you may already have a set of the original Brother ScanNCut pens and holder, but we have found that, although they do an admirable job of drawing, there are some drawbacks. The colour choices are limited and at times we have found the tips to be a bit broad. But now we can use our awesome gel pens and pens with nice fine nibs, by using the Universal Pen Holder. Awesome as it is for drawing, the design could do with some improvements, as it can be a tad tricky to use until you work out the technique that works best for you. The holder and base aren’t very stable when you are trying to set the pen up and keep the test paper in place as well…it’s definitely a challenge. We found that by leaning the assembled unit backwards and holding the base and holder firmly, it all came together nicely and the paper didn’t fall out. But even with that issue, we still love it to bits. The Pen Holder – holds the pen securely in place for you to pop it into the holder on the machine. Before inserting a pen, make sure that the grooves are in the home position, indicated by an arrow on the white part of the pen holder. The grey dial moves in increments. 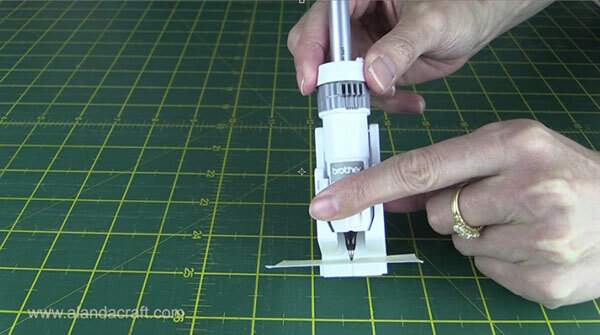 Pull it up and turn the dial until the pen is held tightly in position. Remember to turn the dial to the home position when you are ready to remove the pen or change pens. So now we are ready to place a pen into the holder. Firstly place the pen holder into the base making sure the arrows on the holder and the base, line up. 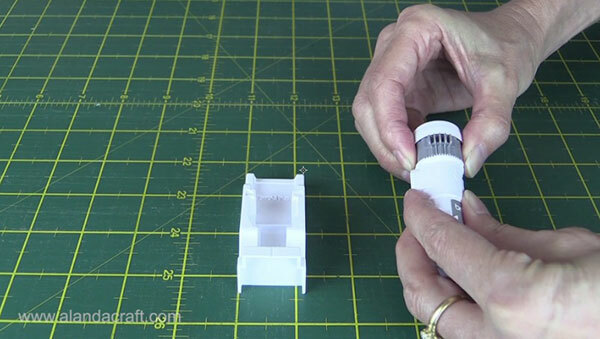 Do not try to push the holder into the base from the top – it won’t fit. 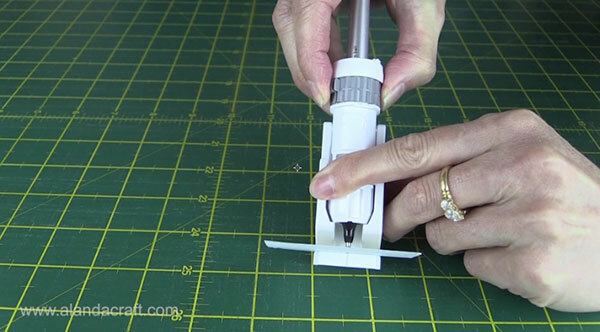 There is an additional groove on the base to help you line up the pen holder. 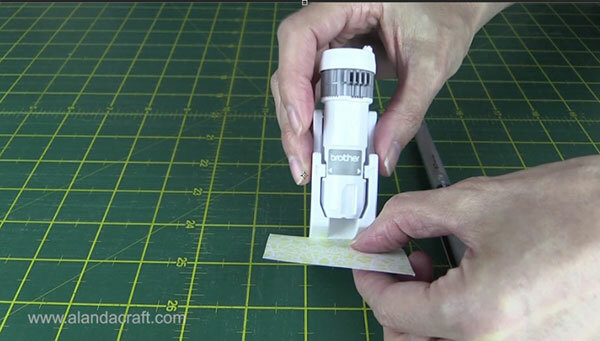 Cut a small scrap of the material that you will be drawing on and place it on the base. This serves two purposes, it sets the pen into the holder at the correct height. For example, if you have card stock the pen will sit slightly higher in the holder than if you are using scrapbooking paper. The paper also stops ink from getting onto the base and marking it. If you do get ink on the base, clean it off straight away. We find that a wet wipe works well. Once you have popped the pen into the holder and it rests on the paper, grip the holder and the base together and just tilt them back a bit to make the next step a little more manageable. Lift the dial and turn until it holds the pen firmly and clicks in place. 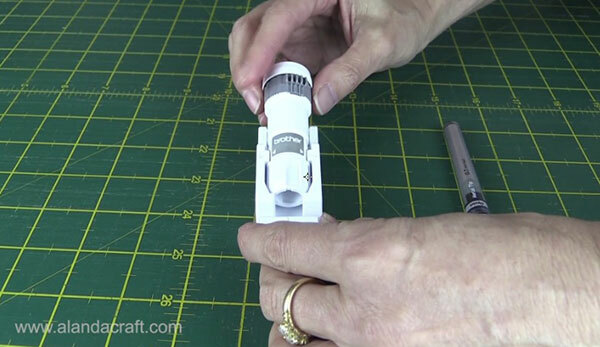 If you have a pen that is too small, you can wrap masking tape around the pen so that it fits. 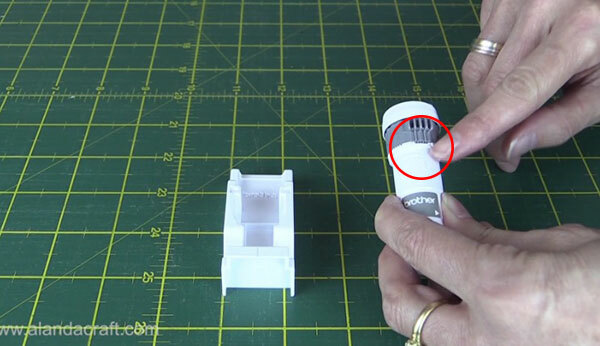 Place the Universal Pen Holder into the holder on the machine. Select your pattern and check your settings. We found that draw speed 3 and draw pressure 0 worked well for us. You are now ready to draw your pattern. And here are some patterns we drew using different pens. The Bridal Shower text was done using a gold pen on black card stock. 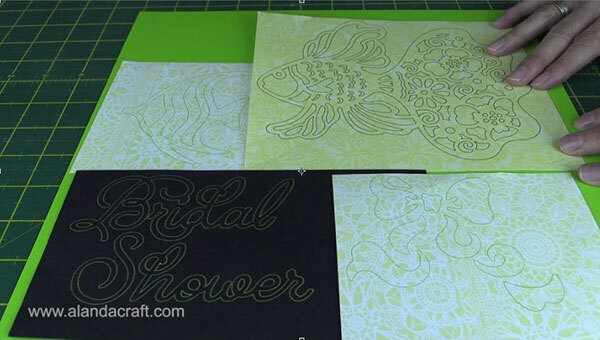 The Angel fish and the bow were done using a green gel pen on scrapbooking paper. The large fish was done using a black Pentel pen on scrapbooking paper. As mentioned above here is a link to a number of pens that we found worked successfully. 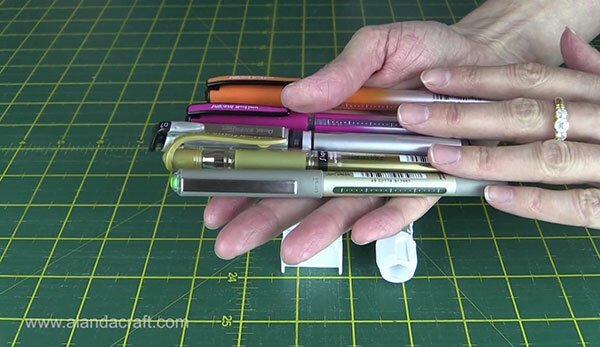 The Universal Pen Holder can be purchased from Amazon. 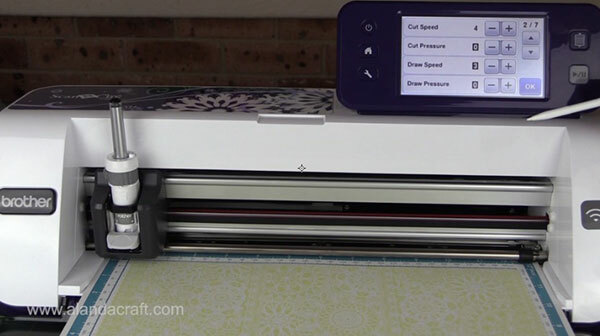 I think you give the best tutorials I have seen on the Brother Scan n Cut machine. Thank you for helping a lot of people. Thank you for your lovely comment Lorraine. Will probably use it in an art journal. It would make a really nice feature. This is a great explanation thank you. 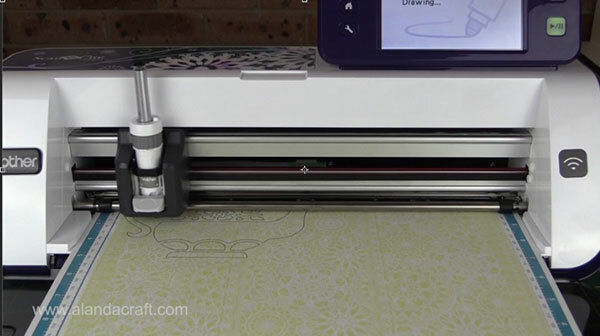 I just bought a CM110 from Lincraft so have been searching for info and watching all your great videos. 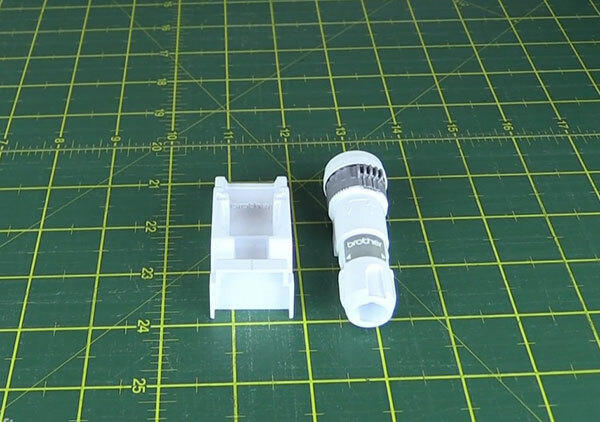 Do you know if the universal holder will work on that model – I gather I’ve bought kind of the base model. 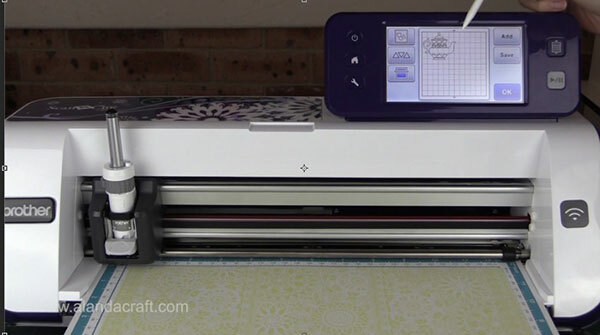 The Universal Pen Holder should fit all the ScanNCut machines both old and new, so it should work. Did you watch the video in the post above? It’s a fiddly process so you may just be missing a step perhaps. Thank you I really enjoyed watching the video, and thank you for making it easy to understand. I am watching your videos on my iPad hoping to get a laptop so that I can download files. The Universal Pen Holder is awesome. One of my favourite ScanNCut accessories. I am hoping that it works with the new ScanNCut DX.